Wahama sophomore Emma Gibbs prepares to swing at a pitch during an April 2 TVC Hocking softball contest against Eastern in Tuppers Plains, Ohio. HARTFORD, W.Va. — A double-digit night as they approach double digits. 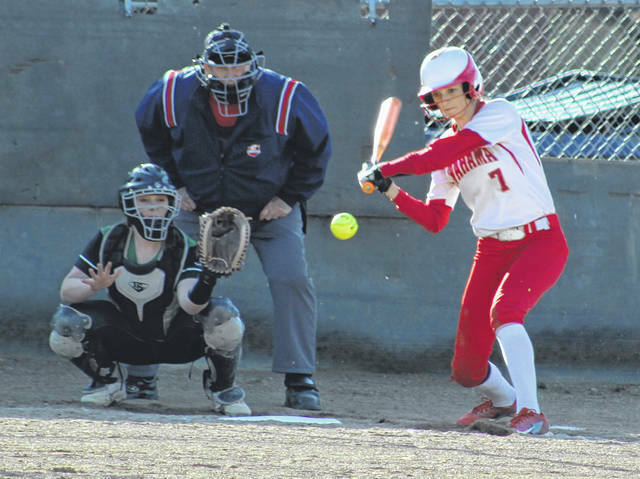 The Wahama softball team remained unbeaten in league play while notching its ninth consecutive victory on Thursday night with a 15-1 decision over visiting Belpre in a Tri-Valley Conference Hocking Division matchup in Mason County. The Lady Falcons (12-1, 7-0 TVC Hocking) led wire-to-wire in the contest as the hosts established a 3-0 lead after an inning of play. Hannah Rose scored what proved to be the eventual game-winning run on a fielder’s choice that allowed Maddy VanMatre to reach safely. Both VanMatre and Emma Gibbs later scored on a one-out double to left field by Lauren Noble. The Lady Golden Eagles answered with a run in the top half of the second as Williams provided a RBI groundout that allowed Hutchinson to score for a 3-1 contest. The Red and White sent 17 batters to the plate in the home half of the second, which resulted in a dozen runs on nine hits, two walks, two fielder’s choices and an error — giving WHS a commanding 15-1 advantage after two complete. Eleven of those dozen runs in the second also crossed home plate with one out or less in the frame. The Orange and Black mustered a pair of baserunners in the top of the third, but the final out was recorded at third base on a failed steal attempt. Because of West Virginia guidelines, the mercy-rule took effect at the midway point of the third — wrapping up the 14-run triumph. Wahama outhit the guests by a sizable 11-2 overall margin and also committed two of the three errors in the contest. Rose was the winning pitcher of record after allowing one unearned run, two hits and a walk over three innings while striking out four. Hutchinson took the loss after surrendering 13 runs (12 earned), eight hits and two walks over an inning of work while fanning one. Noble paced the hosts with three hits, followed by Rose and Tanner King with two safeties apiece. Gibbs, Emily VanMatre, Hannah Billups and Victoria VanMatre also had a hit each in the triumph. Gibbs knocked in a game-high three RBIs, while King, Noble and Maddy VanMatre also drove in two RBIs apiece. Rose scored a game-best three runs, with Gibbs, Victoria VanMatre and Alesia Barnitz also crossing home plate twice each. McDaniel and Williams had the lone hits for BHS in the setback. Wahama played at Trimble on Friday and returns to action Monday when it hosts Miller in a TVC Hocking contest at 5 p.m.